Fair. 0670445800 ALL BOOKS SHIPPED WITHIN 1 DAY OF PURCHASE! VINTAGE Usual signs of a well read book but good overall condition. May not look good on your bookcase after reading and probably not suitable as a present unless hard to find elsewhere SECURE DAILY POSTING FROM UK. 30 DAY GUARANTEE. Very nice book, great condition. Thanks for a delightful return to my childhood love of this little book. When I was a little girl, my mother would take me to our local library. There I always wanted to bring home this particular Madeline book. This book is the first in the Madeline series. Madeline lives in a convent school with eleven other girls. They live in Paris where they walk about in two straight lines. In two straight lines they also eat, pray and go to sleep. Madeline is the smallest of the girls and the bravest. In this book she becomes very ill, frightening the Miss Clavel (the school mistress). Madeline is wisked away into the night by the good doctor to the hospital to have her appendix removed. Life is great in the hospital with ice cream and toys from Papa. The other girls come to visit and decide that they want their appendixes out too. But Miss Clavel wisely tells them to "thank the lord that you are well." 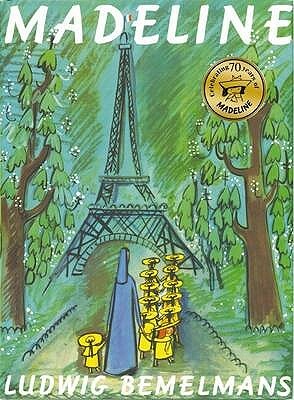 Ludwig Bemelman's Madeline books have with stood the test of time. There are wonderful drawings throughout coupled with charming stories, every book in the series is a gem.